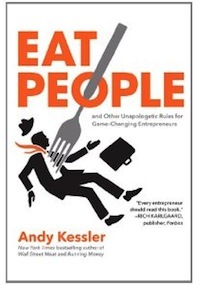 Tag Archives for " Eat People "
In this episode of the the Duct Tape Marketing Podcast, former hedge-fund manager Andy Kessler gives his “unapologetic” advice and rules for helping entrepreneurs find that next big game changing innovation. The title of his most recent book – Eat People – comes from rule #7 – Find ways to get rid of useless jobs. Some might be asking what a hedge fund guy knows about rules for entrepreneurs. Well, Kessler built a wildly successful fund by understanding and identifying the 12 rules outlined in this book as his way of picking winners from the losers. It’s a great point of view, unbiased in some ways from the traditional entrepreneurial thinking. The book rides on the underlying theme that we’re all entrepreneurs and that the days of the traditional job are over – even inside of big companies. In fact, big companies are trying to act more entrepreneurial to stop the onslaught the nimble small biz.